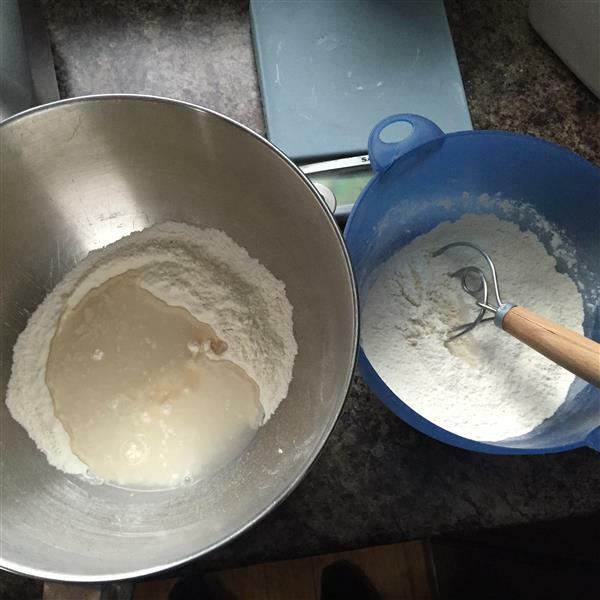 The first step is to make the dough starter (sponge) and mix up the dry ingredients. 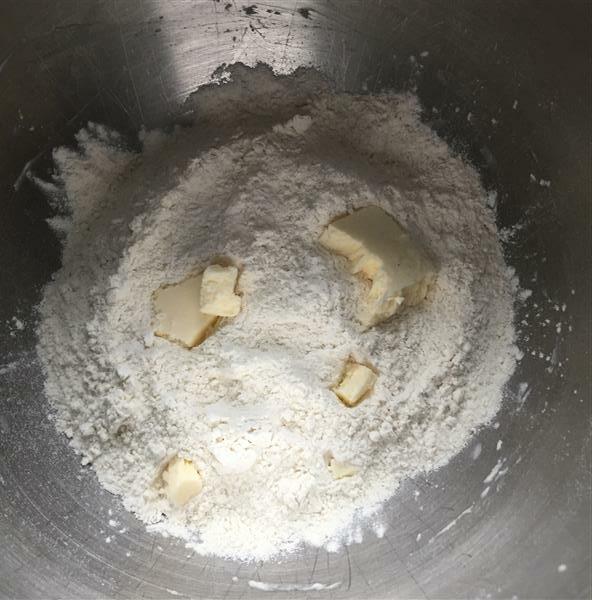 The way I always do this is to weigh out the flour into both bowls, then add the dry ingredients to each of them (including the salt in the flour mixture), and whisk both of those up. Then add the honey & water to the sponge bowl, and whisk it in. Then dust the dry over the sponge. By mixing up both sets of dry ingredients at once, I don’t have to wash & dry the whisk in between. After I’ve sprinkled the flour over the sponge, I weigh in the butter. This gives it time to come to room temperature during the first fermentation step. 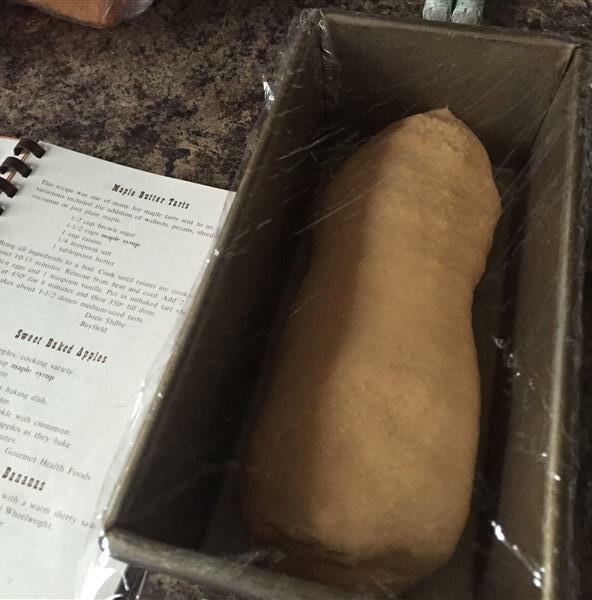 During this time, I baked and cooled the sweet potato. Then mix up the dough, and move it to a proofing container. No surprises here. 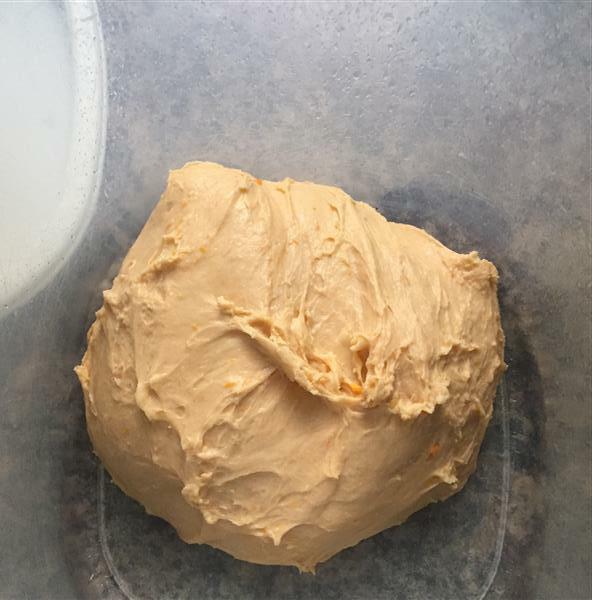 The sweet potato makes the dough an interesting shade of orange. Interlude from the recipe in the background: The same weekend I made this loaf, I also made buttertarts for the first time since I think I was about 13. I remembered this maple buttertart recipe from my Mom’s extensive cookbook collection, and she sent me home with this maple cookbook the last time I visited. I’d say they were a hit, “even though” they included raisins. My husband claims that he’d never had a buttertart before, which I find a bit hard to believe… but given that I haven’t made them since we got married, I suppose it’s plausible. I’m told they’re a Canadian thing. I’m expecting that the “Hungarian Raisin Walnut Tartlets” are going to be somewhat similar to a buttertart.. Only buttertarts usually come in two flavours: raisin OR pecan. I’ve never really understood the pecan ones, because that’s just a mini pecan pie. Amusingly, a friend echoed this exact sentiment when I brought a half-dozen buttertarts to work for my BBQ guys. One thing I’ve been thinking about trying my hand at is raisin pie. I remember my friend Bill’s daughter talking about making him a raisin pie for his birthday, one year. I think I should dig up a recipe. I’m imagining it’d be just a giant buttertart, which sounds a lot less painful to make than tart-sized pastry. Anyway, enough about buttertarts. Back to the sweet potato bread. It turned out beautifully. The orange colour is slightly surreal, but there’s really no discernable sweet potato flavour. I have to imagine it’s healthier than the regular white sandwich loaf, because sweet potatoes are supposed to be good for you, and this has somewhat less butter in it than the regular white bread. Hubby says it fries up really well, too, which means it makes a great grilled cheese sandwich, as pictured at the top of this post! We pretty much always have grilled cheese, soup, and salad, for supper on Thursdays. It works well for me, because I usually have a pretty big lunch at work on Thursdays because of our BBQ/potluck lunches. Last Thursday was a few bacon-wrapped back bacon roasts, wrapped up in tinfoil and baked on the BBQ, then sliced up and served on rolls. We then split a giant costco apple pie 6 ways, for dessert. Oof. But in a good way! 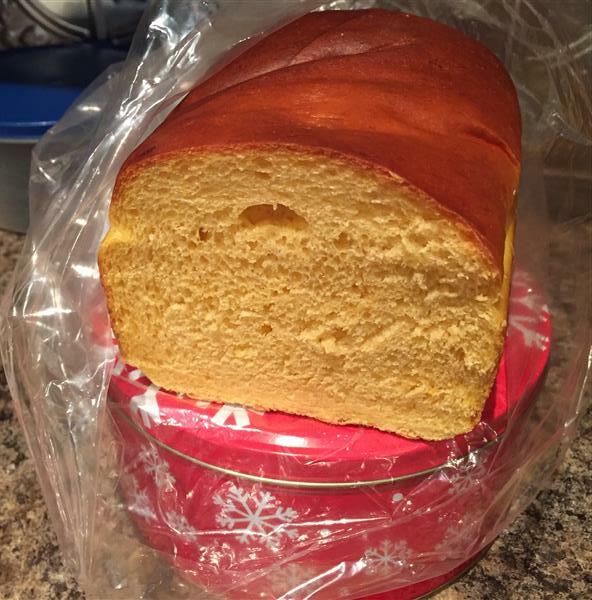 Posted on January 18, 2016 by KristinaPosted in The Bread BibleTagged sandwich bread, sweet potato. I’ve never heard of buttertarts and they sound good! Your bread looks great. I bet this bread did make a wonderful grilled cheese. Rick’s brother once ate about 14 butter tarts in one sitting. I was so grossed out, I couldn’t eat one–not one! Still today, I walk the other way. They totally are a Canadian thing. Are they good? If I going to be Canadian, I guess I should I try one? Grilled cheese with the sweet potato bread? The bread toasted beautifully. Save me a place at the table! Hubby’s an import, so I guess he decided he had to finally try them to be properly Canadian! The way I see it, a butter tart without raisins is really just a mini tarte au sucre. A butter tart with pecans is really just a mini pecan pie. 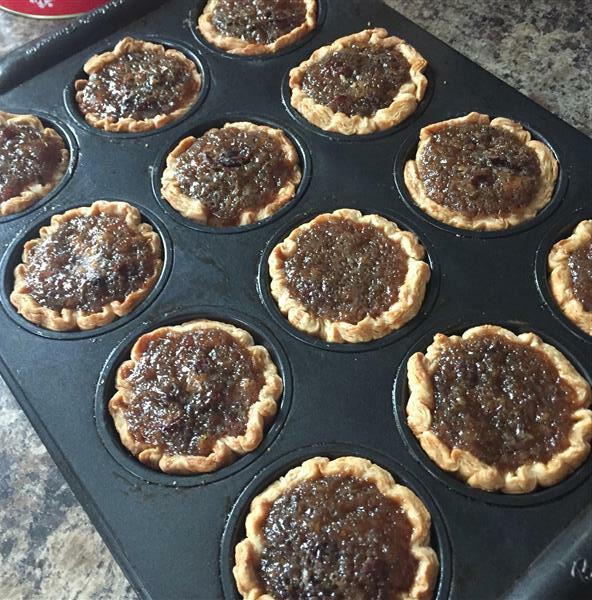 So.. if you like either tarte au sucre, or you like pecan pie, and you like raisins… you should like butter tarts?